In a blow to Italian cycling, Liquigas rider Franco Pellizotti has been axed from the Giro d'Italia roster due to suspicious parameters under the Biological Passport system, according to La Gazzetta Dello Sport. He was one of the big favourites for the race. Suspicions were raised during last year's Tour de France when he reportedly returned peculiar blood values, and he has been monitored since then. There he won the King of the Mountains competition. The Italian paper says a source close to the team confirmed the news, and that the International Cycling Union (UCI) is expected to confirm this news plus the identities of the other suspicious riders tomorrow. UCI President Pat McQuiad initially told news agency Bloomberg at the end of February that there were a "handful of riders" with abnormal values that had been flagged by their Biological Passport program. It has taken a couple of months for the UCI to work with the riders to ensure any medical explainations for the abnormal values were considered in their final evaluation. At the time, McQuaid had said, "With what we now know, we can conclude provisionally that the cause is doping. But of course, we do not know the full medical background of all of the riders, so we will give the riders in question 30 days to provide a valid explanation." Last year both Pelizotti and teammate Vicenzo Nibali were accused of working with infamous Italian doctor Michele Ferrari. Both riders denied the link and threatened legal action. Pellizotti would have been looking to build on his second place of last year, after the subsequent disqualification of original runner-up Danilo Di Luca for EPO use. He won the tough mountaintop stage to Blockhaus in last year’s race and was the 2008 winner of the stage to the Plan de Corones which is identical to this year's 16th stage. Renato Di Rocco, who is the Italian Cycling Federation president and vice president of the UCI, told Italpress Carlo Scognamiglio (ISD-Neri) is also among those riders who will be provisionally suspended due to abnormal values. The ISD-Neri team has said they have had no notification on the matter, and have consulted with their attorney. Slovenian Tadej Valjavec (AG2r) has been named by Spanish newspaper Marca as one of those expected to be identified tomorrow. 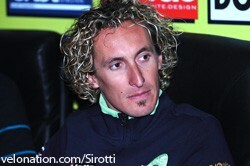 He finished 8th overall in the Italian Grand Tour last year. His best performance this season was 8th on stage two of the Giro del Trentino last month.